The Everything DASH Diet Cookbook: Lower your blood pressure and lose weight - with 300 quick and easy recipes! Lower your blood pressure without ... Boost your energy, and Stay healthy for life! 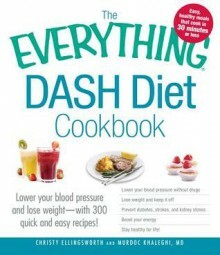 http://Aren21.booklikes.com Aren's Library 5.0 The Everything DASH Diet Cookbook: Lower your blood pressure and lose weight - with 300 quick and easy recipes! Lower your blood pressure without ... Boost your energy, and Stay healthy for life! text The Everything DASH Diet Cookbook: Lower your blood pressure and lose weight - with 300 quick and easy recipes! Lower your blood pressure without ... Boost your energy, and Stay healthy for life! Very helpful and wonderful. I can't wait to implement this.